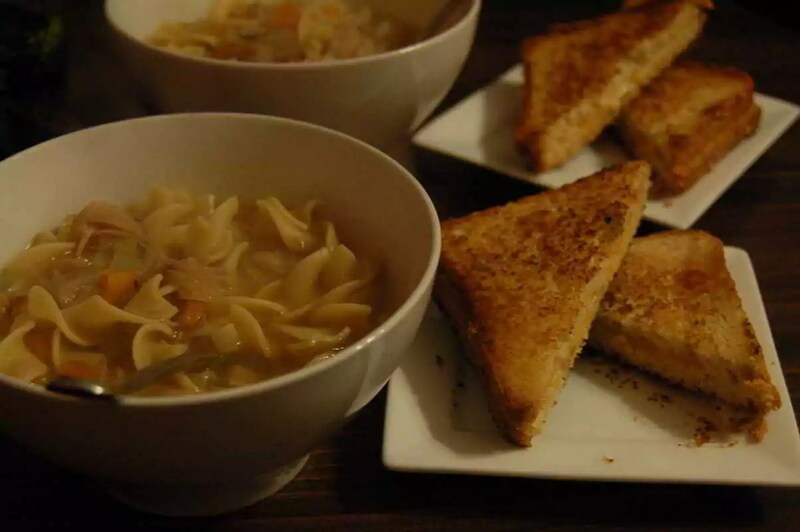 Soup season is getting off to a good start this year with a brand new recipe in our house. Keri and I have recently discovered the wonders of Jackfruit. This tropical fruit has the texture of chicken/pork when pan-fried or roasted and then shredded. It has a slightly sweet taste but otherwise it absorbs flavors very well. For the past week we have been trying out all kinds of recipes and today I thought we’d try making a “chicken” noodle soup. We have not found the fruit fresh at our local markets but you can get it canned at Asian markets. It is important to pay attention to the can, as there are two kinds of jackfruit sold in cans. 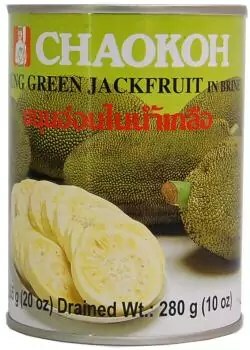 You want the young green jackfruit in brine to make this recipe or any other savory jackfruit dish. The other thing you’ll need for this is a good “chicken” bouillon for the simulated flavor. The best one we have found is a vegan boullion from Edward & Sons, Not-Chick’n. You can get this at Whole Foods. To make the “chicken” you’ll want to open and drain the can of jackfruit and add that to a bowl. Add in two cups of boiling water and one bouillon cube. Let that sit for an hour or so. The idea here is that the jackfruit soak in some of that flavor. Once you’ve let it sit for a while, then fire up the stove. In a skillet, add a couple tablespoons of oil. We use sunflower or safflower oil because their flavors are mild and won’t interfere with our seasoning. Carefully add the jackfruit and fry until each side browns. Save that broth. Once the jackfruit browns you’ll want to take a couple forks to shred it. Once it is all shredded then add the one cup of broth to the skillet and simmer until most of the liquid is cooked off. At this point your “chicken” is ready for the soup. You can roast it in your oven to toughen up the texture a bit more if desired. For the rest of the soup you only need to make some Mirepoix , add the “chicken” and more broth, and whatever noodles you prefer. Full recipe is below. Soak jackfruit in 2 cups boiling water with one bouillon cube for an hour. Pan fry jackfruit in oil until brown then shred with fork. Add 1 cup broth to shredded jackfruit and simmer until broth is reduced. Make Mirepoix. Chop onion, celery, carrot, and garlic. Sautee in oil until onion is translucent. Combine all ingredients to soup pot. Glad you liked it. The chickpea flour pasta is a great idea!